Originally launched in 2006, Le Brassus Quantième Perpétuel GMT by Blancpain is a perpetual calendar outfitted both with the patented system of correctors under the lugs and a second time zone indication. Cased in platinum with a richly coloured Havana brown dial, this special limited edition, restricted to 150 pieces, is accompanied by an exclusively created cigar cutter modelled after an antique watchmaking tool. The remarkably Havana brown colour of Le Brassus Quantième Perpétuel GMT’s dial pays homage to Blancpain’s devotion to refinement and the art of living richly. Cigars, like all of gastronomy, form a part of the passion of celebrated living. 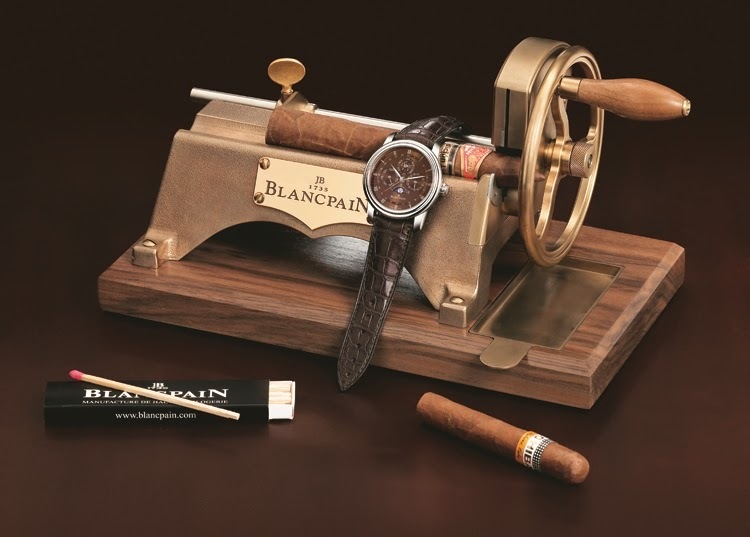 Demonstrating the link between the two universes of watchmaking and refined lifestyle, this exceptional Blancpain timepiece is outfitted with a special rhodium plated gold winding rotor which has been hand carved with symbolic tobacco leaves. Blancpain Le Brassus Quantième Perpétuel GMT (Réf. 4277-3446-55B),Perpetual Calendar with GMT function, Platinum Case, 42 mm case, Sapphire crystal case back, Havana brown dial, Calibre 55A5A self-winding,Power reserve 100 hours, Series limited to 150 pieces. In the eyes of connoisseurs, the perpetual calendar, indisputably, is recognized as one of Blancpain’s grand specialties. In its Le Brassus workshops, Blancpain is devoted to perfecting and miniaturizing this complication. Recently it achieved a world record by developing the thinnest perpetual calendar movement (a mere 2.91 mm in thickness). 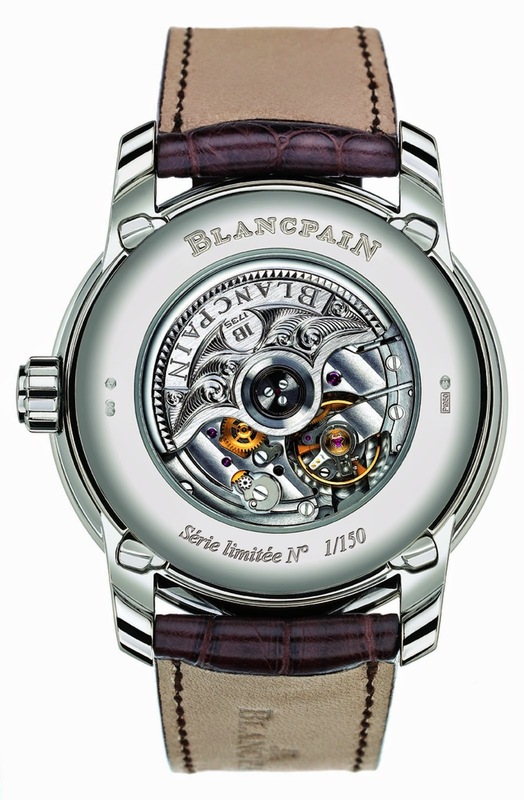 In 2005 Blancpain presented another innovation, its patented system of under lug correctors, developed entirely in its workshops. Instead of placing correctors on the side of watch where they are visible when the watch is worn, the indications of the date, day of week, month, leap year and moon phase, of the perpetual calendar may be adjusted by means of buttons which have been integrated into the lugs of the watch and which may be changed with a simple push of a finger. This constitutes a double advantage, at once both an improvement in the aesthetics of the watch and in its ease of use. 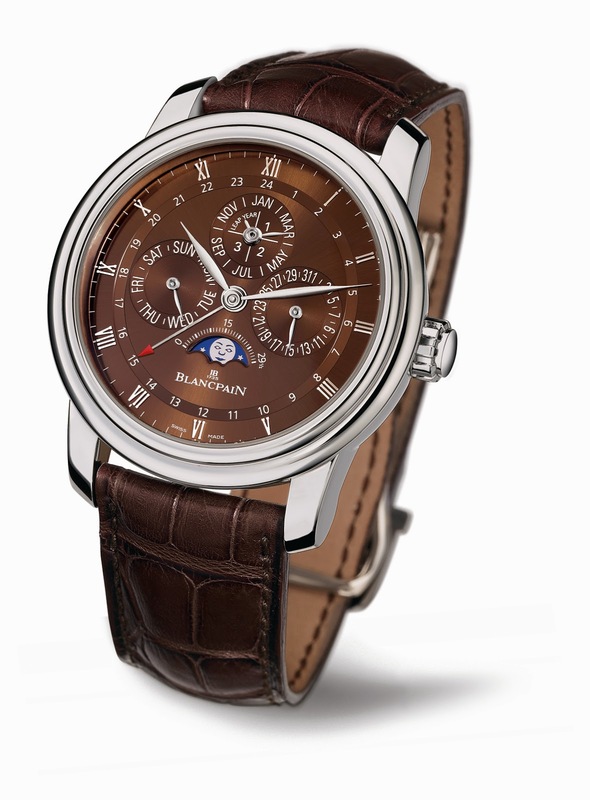 Rising further to this technical challenge, Blancpain introduced this world first in its Villeret Perpetual Calendar which is outfitted with particularly fine case lugs. The Blancpain Manufacture now introduces this innovation in a model from the Le Brassus series and adds yet another complication with the GMT function. In the limited edition Le Brassus Quantième Perpétuel GMT the 312 piece movement brings together two complications aimed at daily life: a perpetual calendar and a second time zone. The dial indicates the date at the 3 o’clock position, the day of the week at 9, the month at 12 all the while keeping track of the variable length of the months, including the variations of the leap years. This can truly be seen as a programmed future memory, finished further still by an elegant moon phase indication shown in a window at 6 o’clock. All of these indications may be adjusted by correctors discretely hidden under the lugs. A second hour hand with a triangular tip shows a second time zone, distinguishing between day and night by a 24 hour scale. The automatic winding system guarantees a power reserve of up to 100 hours. Another achievement: the watch is water resistant to a depth of 30 meters thanks to the sophisticated construction of its correctors. Guaranteeing its rarity, this edition limited to 150 examples, is offered in a platinum case, a metal which is sober, precious and classically elegant. As a result of its innovative system of under lug correctors, there is nothing marring the harmony and purity of line of its round 42 mm in diameter Le Brassus case. The dial with its distinctive Havana tint producing brown gold reflections with hints of brushed sunlight suggests the colour of tobacco leaves. This original and unique allure is echoed by the brown hand stitched leather strap, which for extra comfort is outfitted with a platinum deployant buckle. To accompany this exclusive timepiece, the Le Brassus Manufacture, has created a bronze cigar cutter whose special design recalls an antique watchmaking lathe. Connoisseurs will particularly appreciate this ensemble offered with an elegant brown box, bearing the design of a cigar band and another walnut box useable as a humidor.